This month Mini Oven challenged us fellow Fresh Loafers to create a special bread to commemorate the upcoming total eclipse of the sun. Spurred by astronomic ambitions I began to ponder how to go about this. Just a new bread? Where was the connection to the total eclipse? A two-toned dough? Once I baked a marbled rye bread and found its taste rather underwhelming. Squid ink as a black dye? Not my cup of tea! So it had to be a two-toned decoration. 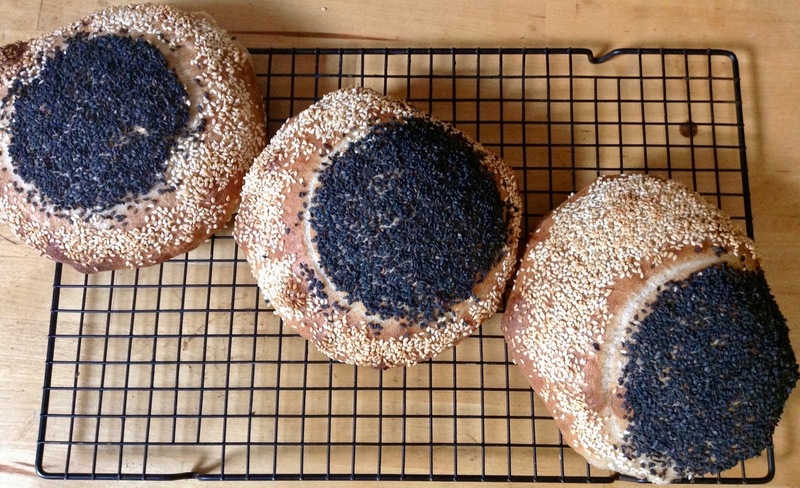 Black and white sesame seeds are in my pantry. Only a suitable recipe was missing. It couldn't be a loaf whose oven-spring would tear and destroy any decorative topping. The answer was a flat bread that would spread more than rise. I found a good starting point in Austrian baker Dietmar Kappl's Fladenbrot,  tweaking it to suit my needs: with a long, cold bulk fermentation and the introduction of a little whole grain flour (I tried it with rye and emmer - both tasted great). To emulate the eclipse I needed a ring-shaped utensil to press the outline of the moon into the dough. A large yogurt tub had just the right diameter (11.5 cm/4.5 inches). We were so happy with my crusty, nutty flat bread that I baked it again, two days later, for my customers at the natural food store that sells my breads. To see the recipe  and pictures of the process, please visit my blog "Brot & Bread ".